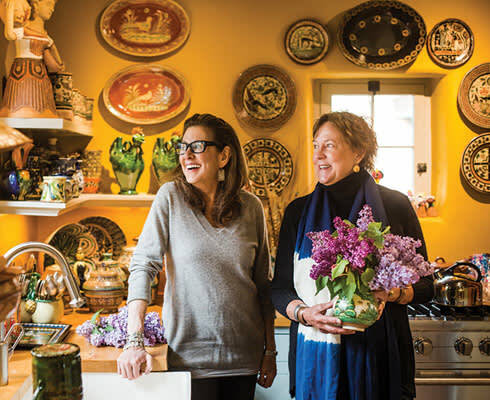 (Above) Judith Espinar (left) andNancy McCabe in Espinar’s kitchen. The International Folk Art Market takes over Santa Fe’s Museum Hill July 10–12. A free community celebration, co-produced with St. John’s College Music on the Hill, happens Wednesday, July 8. Order tickets and find out more details at folkartalliance.org. Nancy McCabe arrived in Santa Fe late one December night 15 years ago, eager to move her family into their new house just off Canyon Road. But the key didn’t work. She began to fret over the prospect of finding a place for her family to sleep on a cold winter night in the midst of the holiday season. Just then, a Mercedes pulled up to the big house next door, and an elegant woman got out to see if she could help. Folk art in Santa Fe hasn’t been the same since. From that first night, when McCabe and family spent the night in their new neighbor’s guesthouse, she and Judith Espinar have traveled together extensively throughout Mexico and Canada, collected together, and influenced each other in myriad ways. They have both managed to build collections that fill their historic houses: McCabe’s still on Canyon, and Espinar’s now a few blocks away. 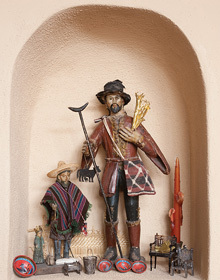 And they have both had a significant role in one of Santa Fe’s signature festivals: the International Folk Art Market. Espinar founded the market in 2004, and remains its foremost ambassador. Her definition of folk art—handmade, based on tradition and culture, and with a point of view—still holds when organizers send out invitations. McCabe, when not traversing the country as a renowned and busy designer of gardens, has worked as a volunteer and devoted scout of new talent. Together, they’ve helped the market become the largest of its kind in the world, attracting over 150 artists from more than 50 countries for three days each July. Last year, nearly 20,000 visitors came to see and shop, with artists from places as diverse as Algeria and Turkmenistan taking home a collective $3 million. “Folk art is meant to be lived with, not displayed behind glass,” says Espinar. And spending time with her and McCabe, in their art-filled homes, offers every budding collector an example of how to do it with panache. Built in 1919, Espinar’s adobe house is located in what was the orchard of an old nunnery, a block or so off Canyon Road. Its intimate scale demands that her collection be carefully curated. And that’s part of the fun. In her collecting, her advocacy, and her personal life, Judith Espinar has fully embraced one of the tenets of the Folk Art Market itself: Art is connection. Gazing around at the saffron walls of her living room, each highlighting carefully textured displays of ceramics and statuary, she calls her collection her friends, her family. And, as with all life-changing relationships, she remembers clearly how it started. Growing up in a Pittsburgh home that didn’t have much use for aesthetics pushed Espinar to study design and art history, but even the hours of lectures and hundreds of pictures failed to prepare her for her first local arts market in Mexico. She was in her early twenties and, she recalls, she just didn’t know that “that sort of art even existed.” The explosion of colors, patterns, and texture she responded to is visible everywhere in Espinar’s house, along with evidence of her education in fashion and art history at Cornell. Sitting on her couch, her fingers absently tracing the rough edges of two fabric throws on the armrest, Espinar explains that pattern sits at the heart of how she thinks about her collection. “The layout of pattern separates a great decorator from a mediocre one,” she says. She plays with the designs in front of her, showing how the simple incorporation of vertical stripes from a nearby pillow can unite pieces from three countries into something harmonious. “This is how you put together a collection, and how I think about making it all work in the house,” she says. Her approach works for everything, an absolute necessity in a house full of not only a mind-boggling number of textiles in various combinations, but ceramics, paintings, sculpture, religious icons, and furniture, little of it understated. 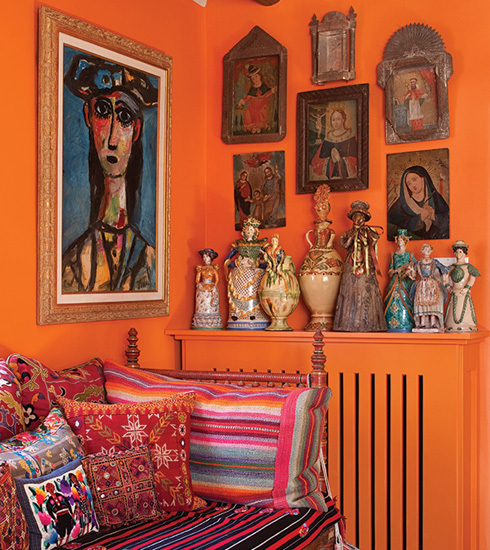 Even the walls—now a palette of pumpkin, saffron, and gray-green—benefited. “I took pieces from my collection and held them up against textiles I had around the house to see what color would work best to show them off,” she says. “Nothing does well on plain white walls.” Not that anything gets a chance. And while Espinar does get involved with the individual creators and their histories—sometimes deeply so, as with a women’s cooperative in Chiapas—her focus is on the beauty and feel that she gets from particular pieces. Her greatest passion at the moment is petatillo pottery, made mostly in western Mexico. “I buy it absolutely every chance I get,” she says, pointing out how the style’s signature cross-hatch and line-and-dot patterns that fill the spaces between figures unify the pieces. Espinar doesn’t cook much for herself, and her kitchen, like most other rooms, serves as a ceramics gallery. Except, that is, when people visit, and then another tenet of folk art shines through: Nothing is just for show. When roving bands of famished and thirsty friends do drop by, plates and glasses, serving utensils, napkins, and whatever else might be required are pulled from walls and off the shelves. At the end of this year’s market, she, McCabe, and others are having a progressive dinner party, starting at one house and moving to the next. Espinar says she’s ready, since she buys a lot of her ceramics while thinking about setting a table for a party. "FOLK ART IS MEANT TO BE LIVED WITH, NOT DISPLAYED BEHIND GLASS," SAYS JUDITH ESPINAR, FOUNDER OF THE INTERNATIONAL FOLK ART MARKET, THE LARGEST EVENT OF ITS KIND IN THE WORLD. Toward the back of the house, away from the public spaces, are “the guys,” a collection of ceramic Chamula animals from Chiapas that sits on a bedroom shelf above a small window looking out into the garden McCabe is designing. Created originally by the Maya as sacred representations of guiding animal spirits, they cluster together, their wide eyes and attentive ears communicating a sense of companionship and warmth. McCabe’s collection of Chamula animals, bought on the same trip, occupies a slightly different place in her house: along a front hallway. There’s also a photograph of the animals in their traditional use on an altar, facing away from the viewer and gazing at a crucifix. Where Espinar is inspired by the beauty of the pieces she collects, McCabe is inspired by the story and the maker. Things got started early for McCabe. She was 10 years old and very excited when she bought her first bit of folk art, a basket. By the time she got to college she was already making choices about whether to buy art or eat. She decided on a hot dog a day. The rest went to Panamanian molas—pieces of embroidered blouses—that were for sale in the Baltimore Museum of Art’s gift shop. Today, hammered silver jewelry from the Haida people of the Pacific Northwest on her hands and at her ears, in her exquisitely decorated house, it’s clear that those early explorations of collecting have paid off. Espinar isn’t timid about mixing bold colors and patterns. Her favorite collection is composed of her “girls,” ceramic figurines from Europe and South America. The first owner of McCabe’s house was Captain Juan de Archibeque, a 17th-century Frenchman who served in two Imperial armies, married a beautiful New Mexican Spanish heiress, and died fighting along an unknown river on the Great Plains. Later, it was purchased by Gerald Cassidy, a founding member of the Santa Fe artists’ colony. He expanded the house to serve as his studio. The deep-umber round-cut tile work of the Archibeque entrance and the diffuse glow of the northern New Mexico skies through the large Cassidy-installed skylights offer the perfect counterpoints to McCabe’s collections of textiles, ceramics, prints, furniture, sacred animal sculpture, musical instruments, and jewelry. 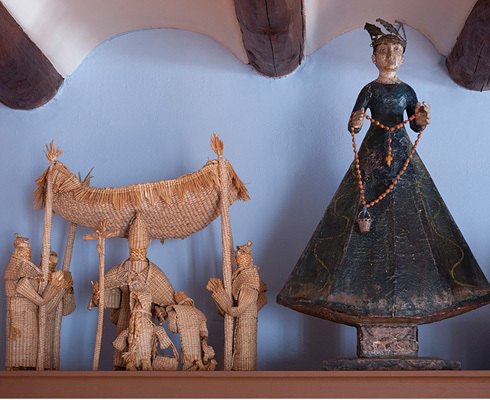 In Nancy McCabe’s home, two antique dolls representing San Isidro, the patron saint of farmers, occupy a nicho. Her pillows and bedspread were made by Malian indigo artist Aboubakar Fofana. 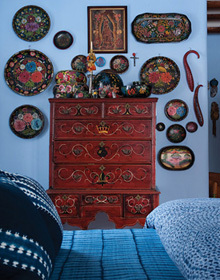 The painted wood bateas (trays) are from various states in Mexico, and the dresser is an American antique. A religious scene from Michoacán, Mexico, where the straw-art tradition is very strong. The old bulto of the Virgin is also from Mexico. 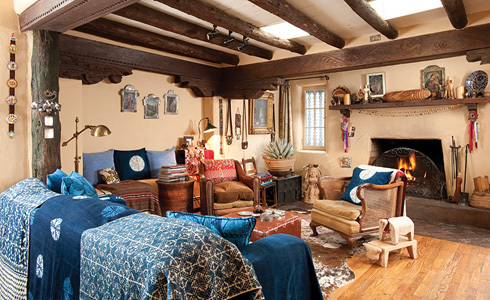 As in Espinar’s house, textiles dominate. And while there are the familiar reds, greens, and yellows, there is also the unusual counterpoint of indigo. “A healing, calming color,” McCabe calls it. Whether it’s the work of Aboubakar Fofana, from Mali—whose hand-dyed and stitched work graces her bed—or Nigerian Gasali Adeyemo’s guinea brocade pillows, which cover her couch, she finds both comfort and power in not only the color but the stories behind the pieces. And, indeed, McCabe has worked closely not only with Fofana and Adeyemo— getting to know their histories, their processes, and even their families—but with many other artists as well. She often helps to run a booth at the market, or recommends the art to others. It’s another manifestation of her belief in the importance of the person behind the art she buys. “I do need to know everything, and not only about the artist,” McCabe says. “I want to know how the art started, what happened, how it evolved, why it still works.” Sometimes, as with her early travels into Chiapas, a successful visit to a market leads to a dinner at an artist’s house, tortillas on the comal, and somebody’s mother or uncle offering the sort of insight priceless to an incurably curious collector. “I probably would have been an anthropologist if I hadn’t gone off to art school, first to the Maryland Institute College of Art and then on to the Minneapolis College of Art and Design,” she says, and she certainly has enough material for three or four dissertations sitting around her house. McCabe describes herself as a big-picture person, both in her work, where she’s happy to be the one designing the garden yet not measuring the rows, and in her collecting, where she thinks constantly about the play between simplicity and complexity, chaos and calm, and the importance of distinct spaces. Her fascination with indigo is one expression; so too is the collection of botanical drawings, sketches by Cassidy, and the oil painting or two that take up a wall in her dining room. The orderly frames and the overall serenity of the sub- ject matter contrast with the riotous colors of the ceramics hung opposite. Nancy McCabe’s living room pillows were made by Nigerian indigo artist Gasali Adeyemo. The bull stool (lower right) is from the Andes, and the armadillo standing on it was made by the Otomi, in the central highlands of Mexico. The ceramic girl by the fireplace is from Oaxaca and was made by Delfina Cruz Díaz and Ernesto Vásquez Reyes. The old Mexican retablos above the couch and the mantel are painted on tin. Unlike Espinar’s, McCabe’s kitchen is obviously hard-used. It’s a visual warren of complementary textures and colors, prominently featuring a collection of green drip-glaze bowls from the Michoacán cooperative Pátzcuaro. Ceramists have ways to fake that look now, she says, but you can’t fake a deep understanding of the cultural and historical underpinnings of the pieces, nor the effect of watching them be made, firelight in your eyes. Different in every possible way, aside from their basic function, is a companion collection of Oaxacan bowls. Complex carvings of animals decorate the thin skin of the calabash gourds. McCabe has stacks of these around the kitchen, the patina of use darkening the edges, and she notes—echoing her belief that art ought to be fun and useful—that some are specifically designed for sipping mezcal. Also well used are the stacks of barro bruñido dishes created by Nicolas Fabian, from Santa Fe de la Laguna, also in Michoacán. Sorting through piece after piece with the telltale ear-and-kernel motif, McCabe draws attention to the role of corn as one of the most important crops in western Mexico. When she and Espinar travel together, they are both looking for different things—Espinar for color, decoration, and a flurry of activity, and McCabe for the powerful language of technique, of origins, and style. But their idiosyncratic collections share a common love for the cultural and artistic traditions that bring and bind people together.